Martinsons in Bygdsiljum is Sweden’s largest producer of laminated wood, and also has an extensive production of sawn wood products. Located in Bygdsiljum, about 60 km southwest of Skellefteå, the Company primarily saws spruce for the production of laminated wood. In 2005, Martinsons in Bygdsiljum had the most modern saw line in Europe. At present, the company produces about 260,000 m3 sawn goods annually. 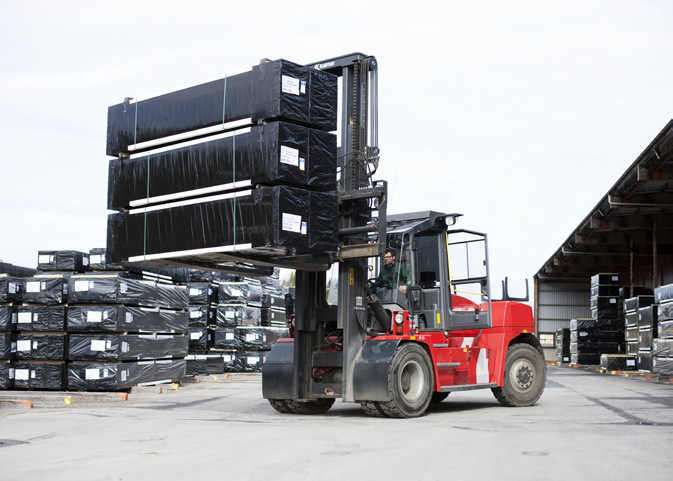 The sawmill in Bygdsiljum currently has 12-14 forklift trucks that are operated by about 25 truck operators. Most of their workday is involved with handling various types of packages. Olov Sjöström, a foreman and head of internal logistics at Martinsons in Bygdsiljum, has been able to follow developments at the company, as he previously worked as a truck and machine operator for 25 years. "Naturally, a great deal has happened during these years, but the greatest change can about four years ago when we began using SawInfo. This created a completely new situation for our truck operators". "Previously, a truck operator would take a package from the production line and place it in an appropriate location. He would write down everything about the package in a binder, and there it would remain until it was time for loading". "Sounds fair enough, right? But problems would arise when someone needed information about the package. Where was the information? Was this the only package in the order, or were there more? These types of questions were pretty common". "In such a case, a production planner might be called in, but he would not always have a complete overview of how a customer’s order looked, and thus needed to bother others". "We now avoid all that. Since we began using SawInfo, everything is in the computer, and is thus accessible to truck operators, production planners, and everyone else involved in sales and production". Olov explains that all production is nowadays controlled by customer orders, every order relates to a rather large number of packages, and there are a total of about one hundred different storage locations at the sawmill. "This is one of the areas where SawInfo really makes things incredibly easier for us. 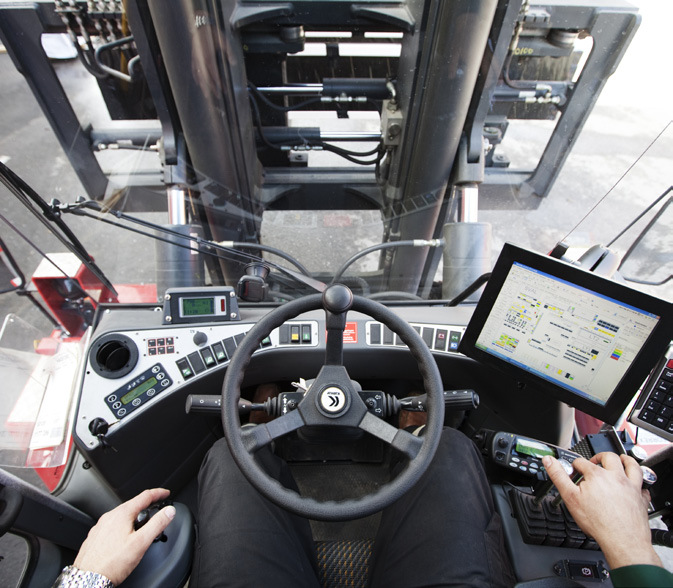 The truck operators can check their computers in the trucks and see all the customer orders and delivery parameters. As almost every order contains several packages, the operator can co-ordinate this at an early stage, creating smart storage areas, which facilitate work involving loading. It’s simply a matter of about thinking one step ahead". "Each order is also indexed by various length groups, with a number of packages of the same length. If the truck operator sees that an ID label indicates ‘package 2 of 9’, for example, he can easily optimise the storage locations, and thus minimise the routes driven within the area". "SawInfo gives us suggestions for appropriate storage locations. They don’t always have to have the same dimensions, but that makes it easy for us to find the most suitable storage place. We have trained the operators to actively search for information in SawInfo, and the graphic interface is very easy to understand". Olov thinks that truck operators with SawInfo gain a better understanding of their own work area, become more motivated to keep things in order, and to do the right thing from the start. Initially, truck operators were given the additional task of helping to enter and add new storage locations. It seemed like added work at that point, but today, they derive benefits that justify those efforts. "The truck operators have become more like operators and less like drivers, and the status of their work has increased. 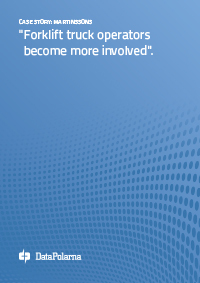 It has become a more interesting job, when you can make your own decisions, and become more involved". "SawInfo gives us suggestions for appropriate storage locations. We have trained the operators to actively search for information in SawInfo, and the graphic interface is very easy to understand". At Martinsons, it became clear that fuel consumption has decreased significantly since the company began to use SawInfo. The fact that truck operators have become more active in searching out information via the computer attached to the truck has naturally also affected developments. "The realisation that many small details can provide us with significant savings has led to a completely different way of thinking than what previously had been the case. Assume that we can save only five seconds per move of each package. This saves us 600 hours per year in handling. Ten minutes faster per loading means 500 hours per year. Increasing load utilisation per vehicle by 2% can mean 30 fewer lorry transports per year. All this is worth a lot of money for our company". Having a customised and tailored solution and participating in program updates, are things Olov Sjöström appreciates. "DataPolarna has really listened to our wishes, and taken them into consideration when adapting the software. We have acted as a sounding board, and have been able to participate and make the software for several other sawmills. We think this feels incredibly stimulating". During the past five years, Martinsons have increased production by about 23%. "But thanks to SawInfo, we have not needed to hire additional truck operators or increase our forklift trucks. Despite increased production, we have been able to function with the same personnel and mechanical resources. We have just been able to organise use in a much smarter way. It’s simply about less writing in folders and more operating trucks, as Olov Sjöström, foreman and head of internal logistics at Sweden’s largest producer of laminated wood, Martinsons in Bygdsiljum".